Talented Bernardini entire To Honor And Serve showcased his talent yet again on the weekend with a game victory in the Group I Woodward Stakes in the US. The Bill Mott trained To Honor And Serve was right up on the pace during the nine-furlong race and the forged clear down the running to post his second Group I win, his overall record now eight wins from 15 starts with prizemoney in excess of $1.7 million. To Honor And Serve is now a six-time Graded stakes winner. At two he had back-to-back wins in the Group II Remsen and Group II Nashua and his three-year-old career was highlighted by wins in the Group I Cigar Mile, Group II Pennsylvania Derby, and Group III Westchester Stakes. To Honor And Serve was bred by Twin Creeks Farm, Larry Byer, and Rancho San Miguel. He is out of Stakes winner Pilfer, by Deputy Minister, who is a half-sister to multiple stakes winner India. Bernardini continues to impress at stud with five Group I winners from his first two crops alone including Alpha, who won the Group I Travers Stakes at Saratoga last month. 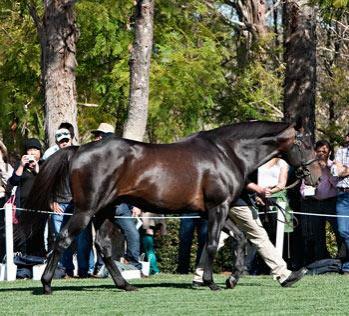 Bernardini (pictured) stands at Darley Kelvinside where his fee in 2012 is $55,000 incl GST. The oldest Australian progeny by Bernardini are three year-olds with Delbridge Racing's Bernardini 3-yold, Bernzigova, aiming to resume in the Spring.